This afternoon, I gave a talk at the Library of Congress. It was a pretty spectacular experience being in these lovely buildings in the city. We're really close, but don't get to DC nearly enough to take advantage of all the amazing FREE things to see and learn about in the museums and other government buildings. After a talk (that I think I possibly jammed too much into - but appeared successful nonetheless - I used my "don't look a gift horse in the mouth strategy"), we strolled to the Jefferson building. In the photo below, there is a peek between the tree and the building at the top of the capital. Darn camera phones - you probably can't see it, but the photo was a cool one. The architecture and ceilings of this building are gorgeous! Below, a beautiful mosaic section. My husband was taking a little tour of the city during my talk. He was excited to show me what he found at the information center - a digital marquee with the details of my talk! He said, "You'll never see that again...". I was like, gee, thanks. But what I think he really meant was that the opportunity to talk at the Library of Congress was pretty special. 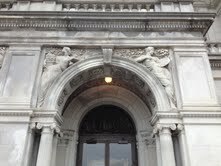 The Jefferson building was spectacular - and not just because of the Gutenburg and Mainz bibles. I particularly loved all the portraits and quotes about books throughout this building. ...she's a grower of bitter melon - a WHITE variety! This is super cool and I can't wait to try it. My parents will flip over this one too. This is where, if I weren't so tired, I would wax poetic about heirloom seeds, and the freaking specialness of this white bitter melon which someone saved seeds of, passed along, and scattered throughout the world among friends, and which in fact, could possibly outlive us. I'm doing a poor job with this explanation, but I'm sure many of you know exactly what I mean. Wow I am always shaking when I have to give a talk. The LOC is one of my happy places. :o) I didn't know they gave garden talks. I wish I had been there. Congrats on your talk!! Sounds like it was a success!! I'm glad you had such a great talk and got to meet such an esteemed woman. I love the photo of you two. I've never been to the Library of Congress. Maybe someday. I'm sure the history is rich. Congratulations! I'm glad the talk went well. Your hubby is proud of your achievements. I is indeed a great experience and honour to give a talk at the LOC. Congratulations for the talk and thanks for the tour photos. Now about the white ampalaya, i've seen it before but I always think that the green one is more nutritious with the green chlorophyll and iron inside the chlorophyll molecules, good for us. Somehow, i also feel the the white ampalaya is not yet complete, haha! Wow, giving a talk at the LOC must be something of an experience. No wonder hubby is proud. 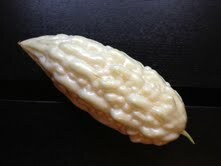 Strangely, two weeks ago, a neighbour gave me a white bitter gourd melon too. He told me to either juice it or cook it with chicken and preserved beans. I found it too sacred to be eaten. I could save the seeds to plant later. His vine was laden with the fruits. You must be very good speaker! dear wendy, congrats at creating the opportunity to give a talk at such a prestigious place. I would love to visit it some day.